One of the hot topics currently circulating about right now is how to get young people invested in our projects. We often hear people talk about youth participation / youth engagement as being key to working with young people. But what does this mean and how do we actually go about doing it? Here’s a few stories and thoughts from the team at Upper Hutt Community Youth Trust on how we’ve tried to do it well, along with some failures and successes in the process. We don’t by any means have all the answers in this, but we are committed to continuing to learn and get better at engaging effectively with young people. The Why is probably one of the first questions to answer in terms of engaging young people, and having them fully participate. Are we doing it because it’s the latest craze, or because our funders want to see us using the terminology, or is it from a genuine belief that it is best for our work, and the development of the young people we are working with? If we want to truly engage young people we have to believe that it’s the best for the young people and our work – not just a token attempt to satisfy ourselves that our ideas are best. Young people are actually quite intelligent, and they see through our sometimes token attempts to engage them on the ideas that we are already running with, but are just checking in with them on. Sometimes even the very questions we ask are not giving freedom for young people to disagree, or fully express any other ideas than what we are already proposing. Long story short, young people are aware when you are being fake or not really creating something they want. A classic mistake we made on this was on a Rippa Rugby tournament that we attempted to run a couple of years back in one of our suburbs. We knew the young people, had been offered some funding to run a tournament and thought well let’s just do it. So we talked to some young people, who said yes it’s a great idea, they’d be keen. We promoted hard out, talked to young people, planned, paid staff etc, and then at the first game we had two young people turn up. Next week we had one young person, and the week after zero. Not the success we had hoped for. Hindsight is a wonderful thing. What if we had, instead of proposing a Rippa Rugby tournament to young people, said ‘hey we are keen to support you guys in a sports tournament, would you be keen on it, what sport would you like to do, where, and what time / day would work for you?’. If we had done that we would have played Rugby union, had the tournament on a Sunday afternoon, and potentially had a successful tournament. Lesson learnt – ask the right questions, enable real participation from young people, and don’t be scared of saying no or asking to change the terms with funders if a proposal made isn’t actually what young people want. Another example from our experience was be running a sushi night for a group of teenage girls who were doing a wellbeing programme. Advertising was sweet, the night planned super well, food top notch. But only a couple of young people showed up. Why? One girl had commented in passing how good it wouldbe have a sushi night, but none of the others really wanted it. As adults we were and thought it would be a great idea, however we hadn’t checked in and worked with young people on it! From our experience the journey of having young people involved in the full process from start to finish is not easy. It’s hard. Things don’t always go to (our) plan. Things get missed, and get messy, but the outcome for the young people and our own learnings is just about always the best. Young people know way more young people as friends than we do. Young people have energy and time. We are effectively training them to be our next generation of community leaders by giving them the opportunities to participate fully, rather than being spectators to what we want to do. So how do we actually go about doing this participation and youth engagement? Sometimes we’re guilty of I don’t know where to start, or I don’t have a full plan on how to do this, so I won’t do anything. It can be the simplest of things but here’s a few thoughts to get the ball rolling. Just walk across the room: Literally just walking across the room, getting to know a young person, listening to who they are, what they like, and how they would like to participate. It really doesn’t have to be rocket science. You don’t have to be young, “hip” or “cool” to do this. Just begenuine and get them to talk more than you do. Be prepared for your ego to take a hit. Your great idea, might be insignificant when we start to hear directly from young people. They might crush our idea in an instant, but come up with one that will better impact the young people you are ultimately working with. We have to be prepared to let our ideas die. We also want to encourage honesty because then when we get it right, we know that’s it’s real. Survey / Evaluate with young people. We must check how things are going along the way. If young people aren’t engaging properly, or the project isn’t getting the traction we need then survey, evaluate, and change to suit the needs of the young people. Engage young people in the complete process: Not just a token conversation at the start of the project, or at the ideas stage, or once the whole thing has been decided. Young people see through the token engagement. It’s about the young people, not us – easy to say, but sometimes harder for us to put into practice. It’s a journey and young people are way more sold on an idea and invested if they got to see the project from start to completion. 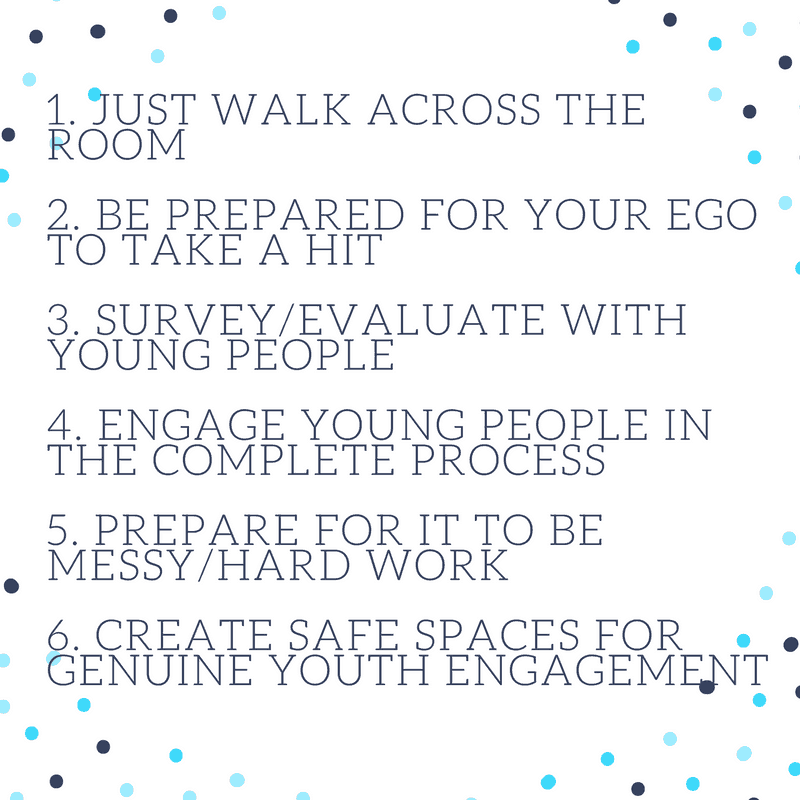 Prepare for it to be messy / hard work: Youth engagement isn’t always clear cut. Doesn’t always lead to exactly what we want. We need to be prepared to have to do some hard work in understanding, negotiating, and working for the best outcome for the young people. It’s definitely the slower and more challenging route, but always more meaningful. Create safe places for GENUINE youth engagement. Young people’s engagement will change the course of your project. If you’re not prepared for that then reassess whether you really want to do it. Young people see through token involvement, or discussion when the outcome has already been decided. Be clear in yourself that you are open to letting the engagement with young people determine how the project looks. Here’s a couple of examples to finish off with. As an organisation we were gifted a radio station for young people that had been really successful in the past, and we were encouraged to put that to use. For a few months we looked into it. We asked young people, we looked at how we would need to train staff to use it. After a couple of months of not really getting anywhere, we realised that actually the young people we were working with didn’t want the radio station. They wanted a space to record their own music. We took out the radio station and converted the space into a recording studio. Young people loved it, and we’ve had some incredible opportunities come about from that. Interestingly we still have adults asking us when we will get the radio station up and running, that it’s a shame we haven’t found young people to run it. We can simply smile and nod, knowing that actually we listened to the young people, have served them well, and the outcome is way better than us pushing hard, investing staffing and financial resource into something that ultimately wasn’t wanted by young people. We have also worked with teams of young people developing events for young people. These have been incredibly successful, albeit messy and at times not as organised as we would like it to be. As adults we have had to learn to pull back, to allow young people to make mistakes in organising, and planning events. But what a way to learn. They get given the responsibility, rise to it, and if not then what a teachable moment or opportunity we have with them to say hey “yup it didn’t go as planned, or yes you didn’t quite deliver, but let’s partner together, work through it so that next time that doesn’t happen”. That’s a few musings from us on engaging with young people. The question we’d like to leave you with today is “how are you going to engage with young people on the projects you are currently working on?” and where in your work do you just need to “Walk across the room”? Upper Hutt Community Youth Trust currently run Collision, a youth space in Upper Hutt. 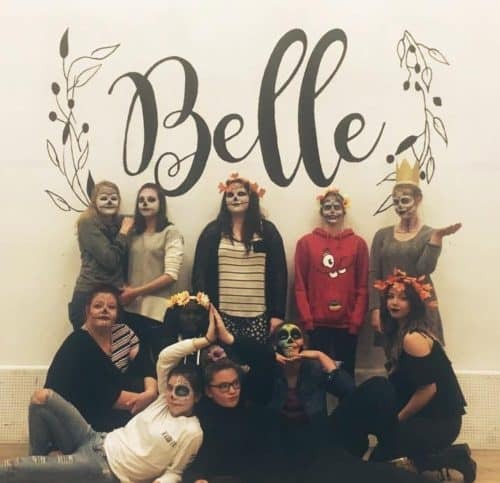 At Collision, they run Belle, a programme for young women, and Kickstart Coffee, a barista training programme seeking to increase employment opportunities, the aforementioned recording studio, a fruit and vege co-operative and more. You can support their work here.